Bring your event contact list under control. Easily share & manage contacts with your entire team. Contact management is hard when your event’s contacts may be scattered across places like your team’s personal phones, emails, spreadsheets or fragmented software systems. It’s even harder to keep your event’s contacts updated and make sure your whole team can access up-to-date contact details. With ClearEvent, contact management is a snap. As participants register, their contact details will be automatically added to your event’s master contacts list. ClearEvent helps to keep contact details updated so you always have the latest contact information. You can also easily import lists that you already have, or manually add your own contacts. Add your own event contacts directly to the list at any time or import contacts from a spreadsheet and share with your team. Simple contact export features let you export all contact details and make sharing easy. 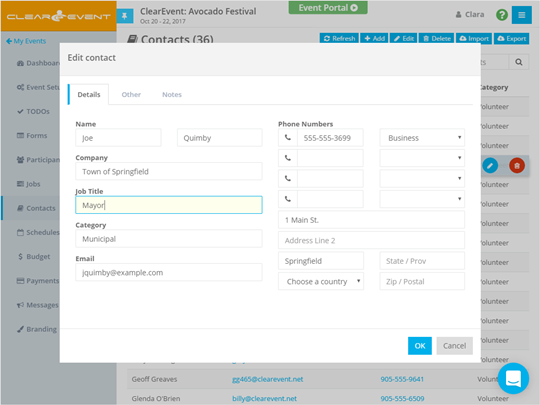 Start Managing Your Event Contacts Today! Create your event for free. No credit card required. No trial expiry dates. Book a demo with an event expert. Learn how you can modernize & streamline your event planning workflows.